Archive for Open Access Publishing. 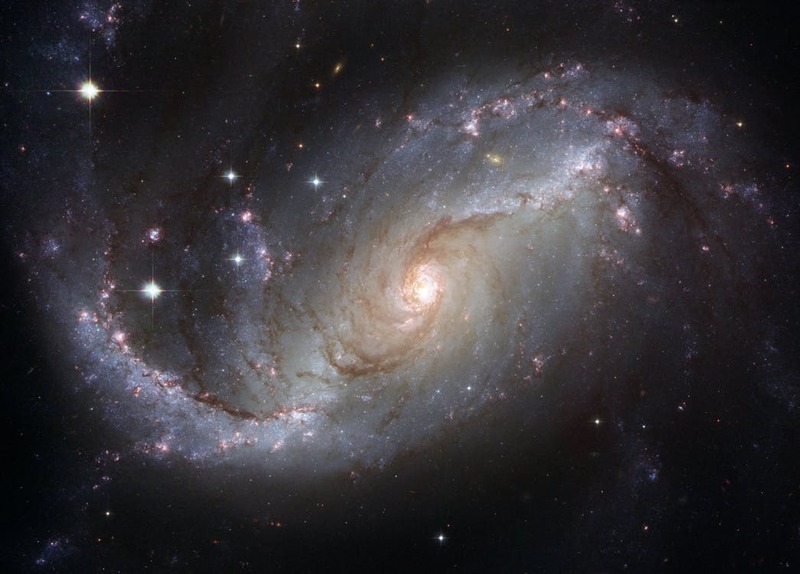 You may recall that the Open Journal of Astrophysics recently published a paper by Syksy Räsänen of the University of Helsinki. I invited Syksy to write a blog post on the Open Journal for Astrophysics about why he chose to publish with us, and I’m delighted to say that his post is now available there and, with the author’s permission, I am reproducing it below on this blog. It’s also available at Syksy’s own blog . It’s quite a long post, but there is some very interesting information in it, which will probably surprise you! The bad news:: the scientific community can no longer afford commercial science journals. Scientific journal publishing is in crisis. Already 25 years ago librarians referred to the rising costs of journals as a “doomsday machine”. In 2012, Harvard University Library announced that it can no longer afford scientific journals, warning that publishers had created a “fiscally unsustainable” situation. The library took the unprecedented step of asking faculty to resign from publications that keep articles behind paywalls. In its 2015 Open Access Policy White Paper, the Max Planck Digital Library assessed the annual revenue of scientific journal publishing as 7.6 billion euros. Divided by an estimated 1.5-2.0 million published articles, they arrived at a cost of €3800 to €5000 per article. The International Association of Scientific, Technical and Medical Publishers has estimated $10 billion in revenue and 2.5 million articles annually, which gives €3500 per article. According to them, 68-75% of the costs are borne by academic libraries. To put the numbers in perspective, the total construction cost of the Large Hadron Collider at CERN –the largest scientific experiment in the history of humanity–was around 5 billion euros, or 500 million euros per year. The cost of science publishing would cover the construction of 10 to 20 top-of-the-line successor experiments to the LHC. It is equivalent to the salaries and overheads of 150,000 to 200,000 postdoctoral researchers per year. This is likely more than the combined number of postdocs in the United States and the European Union. Is there any other industry where corporations pay nothing for the raw materials, have negligible processing costs and enjoy a captive market that automatically buys everything they produce? This setup leads to record profits. For example, the profit margin of Elsevier’s Scientific, Technical & Medical publishing division in the years 1991-2013 was consistently over 30%, and in 2013 it was 39%. For comparison, in the same year Apple, Google and Microsoft had profit margins of 22%, 20% and 28%, respectively. No wonder Robert Maxwell, a pioneer of scientific journal publishing, described the business as a “perpetual financing machine”. In the past, publishers at least had the expenses of printing and shipping journals. With the internet, this cost has disappeared for many journals. However, prices have not come down – quite the opposite. Thankfully, the same technological advances that have made commercial journals so profitable have also rendered them unnecessary. Journals used to be needed for registering and communicating research, for archiving it (via paper journals in libraries), and for performing quality control via peer review. In cosmology and particle physics, the first three services have been provided by the internet archive arXiv since 1991. Depositing articles to arXiv is free, and they can be read for free in perpetuity. In 2018, 140,616 articles appeared on arXiv, and its estimated total expenditures were $1,915,997, or 12€ per article. Other disciplines, such as economics and biology, have followed suit, either starting new categories on arXiv or setting up their own archives such as bioRxiv. There is no reason why this model cannot be extended to all fields of science. A lot of discussion around the cost of journals centred on open access, so it is important to emphasise one thing: the issue is not open access. That problem has been solved by arXiv 27 years ago. The question is how to organise peer review in a cost-effective manner. This is where overlay journals come in. The idea of overlay journals is simple: they are journals that concentrate on the only thing journals are needed for anymore, namely peer review. As articles appear on arXiv (or other online archives) anyway, there is no need to duplicate their work. An overlay journal has a website where papers (typically already available on arXiv) can be submitted. Peer review is conducted as usual, and in case of acceptance, the final version of the paper is updated on arXiv, with a journal reference and DOI link to the journal website. Custom toolkits for overlay journals have been designed for more than 10 years, for example in the astrophysics RIOJA project. These days the necessary software is also available off the shelf from Scholastica. The service costs $99 per month plus $10 per submitted article, and getting a DOI from Crossref costs $1 per published article. As in the case of arXiv, the costs scale well with the number of papers. If a journal publishes 100 articles annually and has a 2/3 rejection rate, the cost works out to €38 per article – about 100 times less than the sum currently paid for article publishing. Given that open archives and overlay journals could save 7 to 9 billion euros every year, why haven’t they already replaced commercial journals? Unfortunately, the existence of a more optimal configuration does not automatically lead the community to shift there. Instead, people respond to individual incentives, and scientists are no exception. The publishing peer Robert Maxwell noted that “scientists are not as price-conscious as other professionals, mainly because they are not spending their own money”. As journal fees are paid centrally, there is little motivation for an individual researcher to change their publication pattern. Established journals are seen to provide a quality stamp that is necessary in the competition over positions and grants. Also, founding an overlay journal requires an investment of time that does not necessarily yieldproportionate professional rewards. So researchers as individuals have rational reasons for not changing the system. What about libraries and scientific consortia that are struggling to bring the costs down? Unfortunately, institutional efforts have often concentrated on the narrow problem of getting journals to accept payment from the author rather than the reader (i.e. open access). However, the main issue is not whether the money is paid by the author or the reader (or rather their institutions), but what they are paying for. Thus, for example, the SCOAP3 consortium has become part of the problem by providing life support to commercial journals. It has arranged to pay publishers vast amounts of money, entirely incommensurate with the actual costs, to make articles open access, guaranteeing them a steady stream of revenue. The open access initiative Plan S launched last September is more ambitious. Particularly noteworthy is the commitment to provide incentives to establish new open access journals and platforms. However, open archives are only “acknowledged because of their long-term archiving function and their potential for editorial innovation”, not as publishing channels of their own right when paired with overlay journals. A lot depends on how the initiative will be implemented, but for now the scheme seems to focus on the old-fashioned aim of getting commercial publishers to convert journals to open access. According to the Max Planck Digital Library White Paper, switching all commercial journals to an open access model would drop the cost of publication to between €1,100 and €2,000 per article. This would cut expenditures by a factor of 2 to 5, saving billions of euros every year – and continuing to waste billions of euros every year. It is striking that the principles of Plan S contain no commitment to maximising the returns on public money and optimising financial sustainability, even though this is the heart of the matter. Instead, it supports the continuation of the commercial publishing model in co-operation with corporations, whose interests are at odds with those of the scientific community. We do not need to reform the business model of scientific journal publishing, we have to abandon it. Open access consortia should start supporting a publishing model that begins from the needs of the scientific community and aims to fulfil them in an economical manner, while helping to make the transition as smooth as possible. This involves communicating with scientists about the costs of corporate publishing, following and expanding on Harvard’s example of calling on scientists to use the power of their labour (often given to the publishers for free) to change the situation, and providing incentives and support to establish and publish in overlay journals. Scientists, in turn, need to re-evaluate their brand loyalty to established journals, and give appropriate career merits for time spent on changing the publishing system. Open archives and overlay journals are not a utopian solution for the future. Discrete Analysis, Open Journal of Astrophysics and others are publishing already. They are a proven model for open access publishing and quality peer review in a modern, cost-effective manner tailored to the needs of the scientific community. The sooner they become the new standard, the more money we will save for science. As term staggers to its close tomorrow, two things this morning reminded me that I should post a final update for the The Open Journal of Astrophysics. I’ve been regularly boring all my readers with a stream of stuff about the Open Journal of Astrophysics, but if it’s all new to you, try reading the short post about the background to the Open Journal project that you can find here. 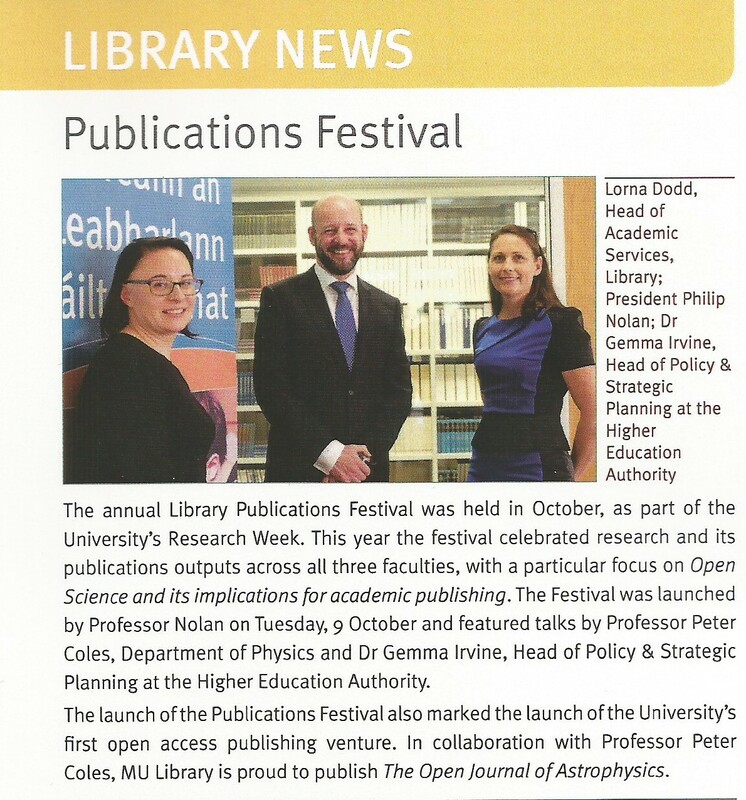 The first item was a little piece in the latest edition of University News (which was delivered this morning) about the launch event for the journal here at Maynooth University way back in October. I didn’t make it into the picture above as I had to leave the event before the end in order to give an undergraduate lecture, but the appearance of this piece reminds me to express once more my gratitude to Maynooth for providing such excellent support for this project. The other event this morning was an email notification that the OJA has received yet another submission. We now have a number of papers in the pipeline, and interest seems to be picking up. I can’t say how many submissions will actually be published, but the papers we have received are working their way through the peer-review system and we’ll see what transpires. On a related point, a few people have asked me why the Open Journal of Astrophysics is not in the Directory of Open Access Journals (DOAJ). The answer to that is simply that DOAJ requires a minimum of five papers published in a calendar year and because we had a long hiatus before the re-launch we don’t yet qualify. The way things are going we should meet the threshold for 2019 pretty quickly. Though I stress that the Editorial Board of OJA is not going to compromise standards just to get listed on DOAJ. we are hoping to increase the number of submissions with time (in a manageable way). As it happens, we do have funds available to promote the OJA as I think quite a large number of members of the astrophysics community still haven’t heard of it. This also makes it a little difficult to enlist referees who perhaps jump to the conclusion that this is a dodgy or predatory journal. There are many of these about, sadly, but I hope we can establish relatively easily the fact that we’re not of that ilk. I would like here to repeat a small request I posted a while ago. Do any of you have any ideas for promoting The Open Journal of Astrophysics? We could advertise directly in journals of course, but I’m wondering if anyone out there in the interwebs has any more imaginative ideas? If you do please let me know through the comments box below. Just finished today’s teaching so I thought I’d chill for a few minutes and pass on a few quick updates about the Open Journal of Astrophysics, which was formally (re)launched last week. The first thing is that at the weekend I sent an online training video and guide around the members of the Editorial Board and introduced them all to the new platform’s messaging system, which is a very convenient way for us to keep in touch. I had lots of volunteers for the Editorial Board and I couldn’t select everyone but I tried to choose members with a good geographical distribution, spread of expertise, and gender balance. We may add more in due course, as we’re still quite cosmologist-heavy, but I think we have enough to get started: we have editors in Australia, France, Italy, United States of America and Mexico as well as the United Kingdom. We have received some submissions already and are dealing with them through the new platform, which is requiring the Editors to engage in some `on-the-job’ training. Hopefully they’ll get the hang of it soon! I’ll also take this opportunity to remind you that the Open Journal of Astrophysics is open for new submissions, so please feel free to give it a try! Publishers of scientific journals are facing renewed threats to their business models from both sides of the Atlantic. Tuesday afternoons are usually quite busy for me, with teaching sessions from 12-2 and 3-4 this term, but today turned into almost four consecutive hours of activity as I gave a talk on Open Science at a lunchtime event as part of Maynooth University’s Library `Publication Festival’ which, in turn, is part of `Research Week’. 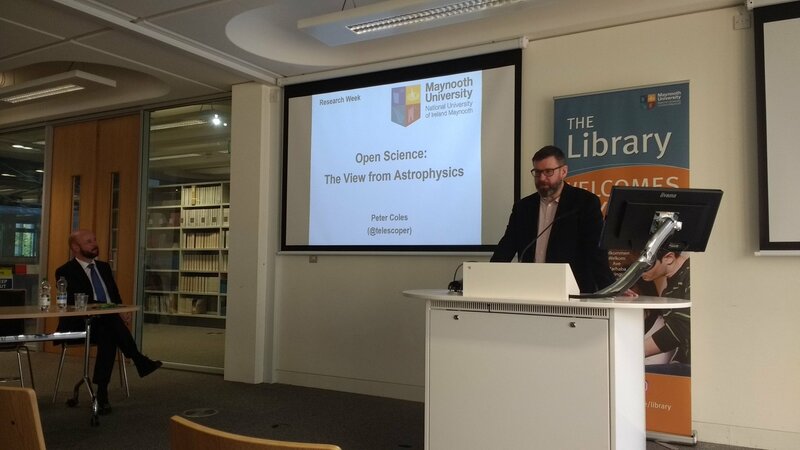 I talked about Open Science generally from the point of view of astrophysics for a bit, but the main purpose of the event was to launch the Open Journal of Astrophysics which also marks the debut of Maynooth Academic Publishing as an OA publisher. Fortunately I’d managed to get everything up and running before the talk so I was able to show the assembled throng the actual journal with actual papers. Anyway, here are my slides if you’re interested. P.S. The gentleman at the left of the picture is Professor Philip Nolan, the President of Maynooth University, who launched today’s event. P.P.S. I’d like to point out that I did not mock the UK Prime Minister Theresa May by dancing at the podium prior to my presentation. The Open Journal for Astrophysics is Open for Test Submissions! Just a quick announcement that we’re stepping up the testing phase of the Open Journal for Astrophysics and would really appreciate it if astrophysicists and cosmologists out there would help us out by submitting papers for us to run through our swish new refereeing system. Just to remind you The Open Journal for Astrophysics is completely free both for submission and for access; there are no Author Processing Charges and no subscription payments. All papers will be fully peer-reviewed using a system which is, as far as I’m concerned, far better than any professional astrophysical journal currently offers. All this is provided free by members of the astrophysics community as a service to the astrophysics community. 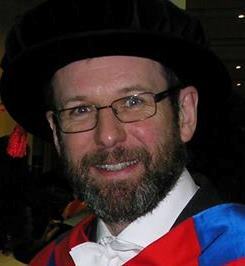 I know that many will be nervous about submitting the results of their research to such a new venture, but I hope there will be plenty among you who agree with me that the only way we can rid ourselves of the enormous and unnecessary financial burdens placed on us by the academic publishing industry is by proving that we can do the job better by ourselves without their intervention. The project has changed a little since I suggest the idea last year, but the submission procedure is basically that which I originally envisaged. All you have to do is submit your paper to the arXiv and let us know its reference when this has been accomplished. Our software will then pick up the arXiv posting automatically and put it into our refereeing pipeline. In future we will have our own latex template to produce a distinctive style for papers, but this is not needed for the testing phase so feel free to use any latex style you wish for your submission. For the time being the OJFA website and associated repositories are not publicly available, but that’s just so we can test it thoroughly before it goes fully live, probably early in the new year; at that point all the papers passing peer review during the test phase will be published. I’m really excited about the forthcoming launch which will, I hope, generate quite a lot of publicity about the whole issue of open access publishing. If anyone has any questions about this please feel free to ask via the comments box. Also please pass this on via twitter, etc. The more, and the more varied, papers we get to handle over the next couple of months the quicker we can get on with the revolution! So what are you waiting for? Let’s have your papers!